USA - Following its well-received launch at PLASA London in October, Avolites' compact-yet-powerful Quartz console makes its debut at LDI in Las Vegas. Respected entertainment technology distributor and Avolites' US partner Group One will be hosting Quartz on booth #1915 from 21-23 November at the Las Vegas Convention Center. 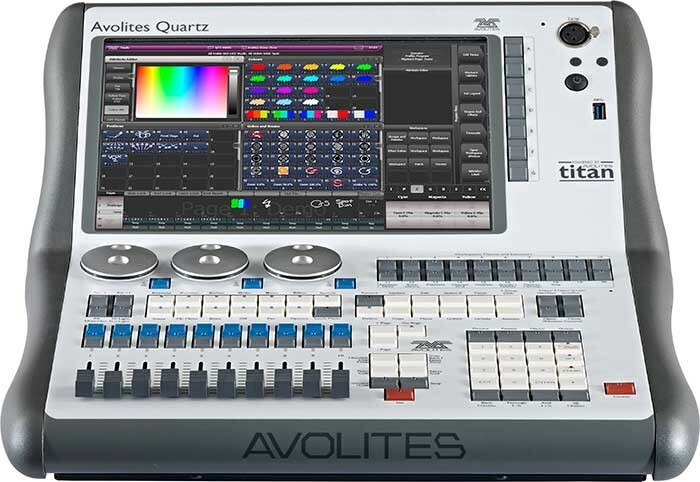 "Quartz is the newest addition to the Titan Mobile family, complete with on-board processing and a bright, vibrant 12.1" screen," says Avolites sales manager, Stephen Baird Smith. "Super compact, measuring only 16.7" wide, the Quartz is positioned as the ideal companion for lighting projects ranging from touring and festivals to clubs and one-offs. It is Avolites' smallest fully-featured console. "Featuring the same high quality faders and hardware you've come to expect from Avolites, the Quartz can go anywhere you can, ideal for life on the road. Offering full compatibility with Multi user, the Quartz is also perfect for use as a back-up or extra programming surface, cutting your programming time. Quartz is ready to benefit from multi band Sound to Light Triggering functionality, offered in Titan version 9." Koy Neminathan, Avolites sales director voiced his excitement for one of the newest products in the Avolites range: "I'm absolutely delighted with the feedback that the Quartz has received so far. We can't wait for the US market to see it for the first time, and we're sure that everyone will share our enthusiasm about the console there, too!" Also on stand is the Avolites Tiger Touch Fader Wing, which has the same profile as the Tiger Touch II and features 30 playback faders all electronically labelled with an LCD screen. Avolites is also exhibiting its 'ultimate in live control' Sapphire Touch and new Wing, offering an additional 30 motorised faders and a third hi res touch screen. The full Titan range is also available for demo and hands-on experience, running the amazing software features of the new Titan Version 8, packed full of the latest features to enhance the Titan experience and take your shows to the next level. Avolites Media will also exhibit at LDI on booth #1116, showcasing the Ai S2 media server, which offers all the benefits of Avolites' powerful hardware in a server drastically reduced in size and cost. Also on the stand will be latest Ai Infinity EX servers, and the Sapphire Media. Avolites Media's Ai servers have recently powered incredible visuals for some of America's biggest acts. Infinity 8 Media Servers pumped out incredibly complex visuals mapped onto forty hexagonal moving towers on Bon Jovi's huge 'Because We Can' world tour, prompting some to name it 'the most ambitious rock show ever'. This year, fans across the US roared to the visuals of US rapper Childish Gambino's energetic show as Avolites Media's Ai Infinity EX8 server pumped out a dynamic and interactive graphic display. And more recently, Ai powered what's thought to be the world's biggest hologram effect at a live music performance as Eric Prydz played New York's Madison Square Garden. The Avolites Media team has spent 12 months listening carefully to what users felt they needed from the next installment of Ai. The results of this user led development process are illustrated in an impressive version 8 feature set and a more unified workspace that delivers 'everything you always wanted' in a media server. It's truly a game changer. Avolites MD Steve Warren will also be taking part in the LDI Projection Live Design Master Classes 19 - 20 November. Visit Group One/Avolites on booth #1915, and Avolites Media on booth #1116 from 21-23 November at the Las Vegas Convention Center.